See Who’s Shopped the Spot Lately! We’ve been so busy shopping barns, basements and attics and getting ready for our fall season, we’ve been remiss in posting photos of our recent visitors, customers and friends. Herewith, forthwith, and toot-sweet: some favorite recent Mystery Spotters! 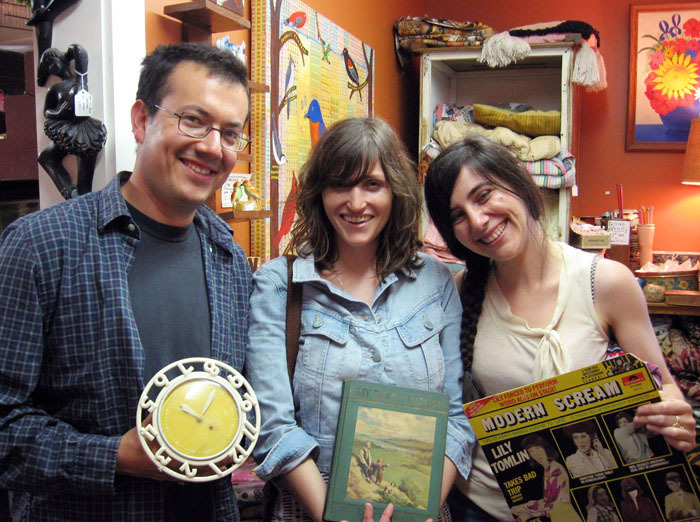 Right before they stepped out onto our front porch to play an amazing free show with Mercury Rev for the townsfolk of Phoenicia, Dean Wareham and Britta Phillips browsed the vintage wares of the Mystery Spot. Dean scored a stack of used vinyl, and Britta scooped up this beautiful vintage 50s deep blue velvet halter top, among other goodies. 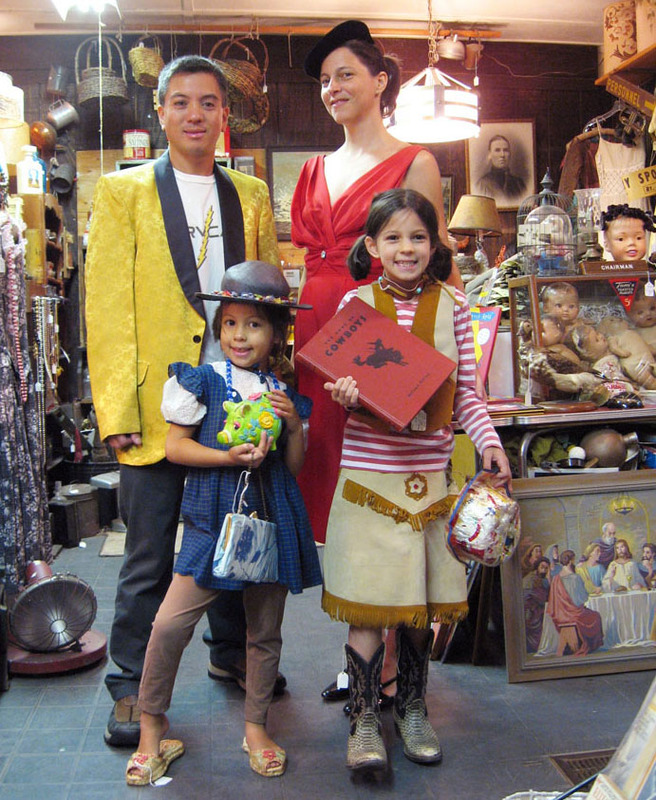 World-famous artist/illustrators Jordin Isip and Melinda Beck and their daughters Chloe (6) and Simone (8) came up for a visit and rocked the Spot. Jordin and Melinda are prom-worthy in a Sixties Rat Pack gold dinner jacket ($95.) 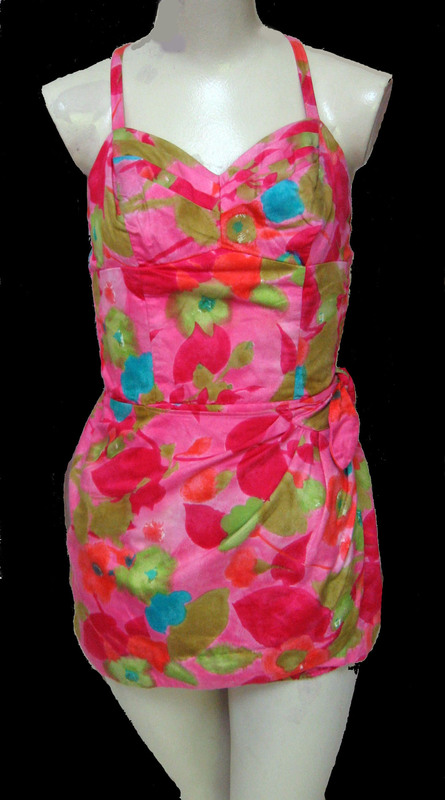 and Sixties red chiffon cocktail dress ($85. ), Simone is clad in a vintage girl’s plaid Fifties frock ($20.) with purse, hat, sandals and garish 70s piggy bank ($8.) , and Chloe the cutest cowgirl this side of the Rockies, complete with cowboy boots, cowboy book, and unusual handmade confetti-cellophane cowboy hat! People often ask us who created the beautiful Mystery Spot log hanging above our entryway. Full credit goes to artist and dear friend Keith Strahan. When we moved to the old Gormley Hotel on Main Street last year, our biggest concern was whether or not the log would fit the porch (as it was custom-made for our previous location). It fit perfectly! A sign from the heavens indeed. A while back the editor of The Believer in San Francisco contacted us and invited us to contribute artwork to the magazine. We weren’t familiar with this McSweeney’s publication at the time, but once we took a gander, we were hooked. Have you seen it? In our opinion it’s absolutely the best publication out there. Books and culture, art and photography; a cover-to-cover must-read every month. Anyway, this is a long-winded way of getting to the photo above. That’s the aforementioned editor, Andrew Leland on the left. We’d never met in person until this summer, when he made a special trip to see us and our shop. Accompanying him, Betsy Wright Milton and Lily Gurton-Wachter. 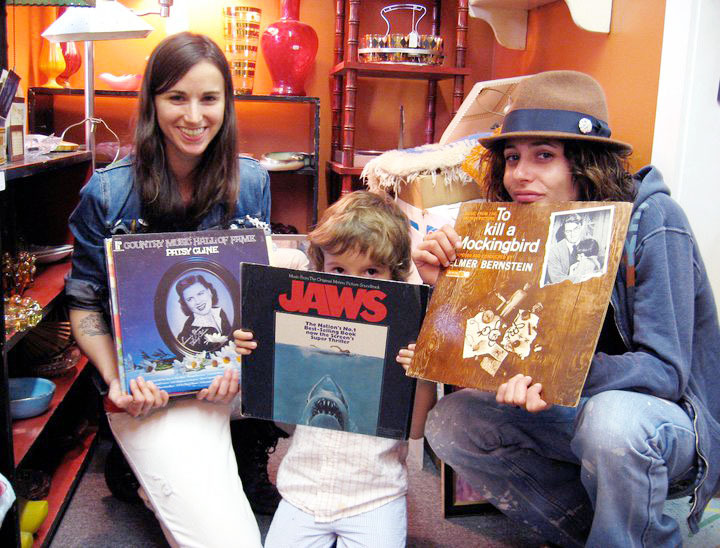 Behind them, the original painting of Songbirds of the Catskills, which was published as the inside front cover of The Believer in 2008. 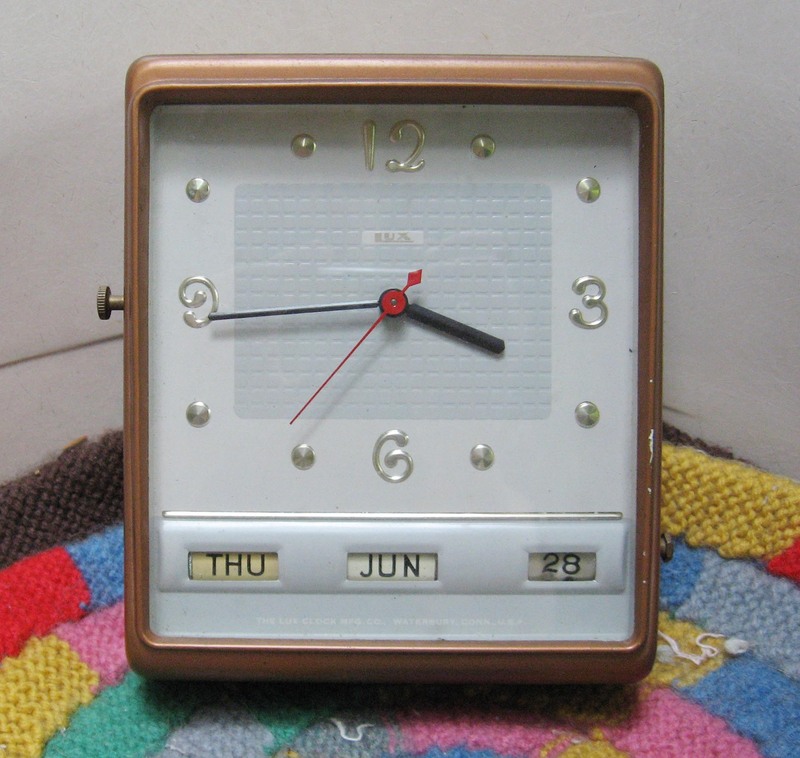 In their hands, some of their Mystery Spot loot: a vintage Fifties yellow and white kitchen wall clock ($35. ), an old children’s storybook, and a Lily Tomlin LP. Needless to say, we had a wonderful time hanging out and cooked up all sorts of future projects. Can’t wait! Cassandra Jones and Ben Olson made out like bandits here at the Spot. 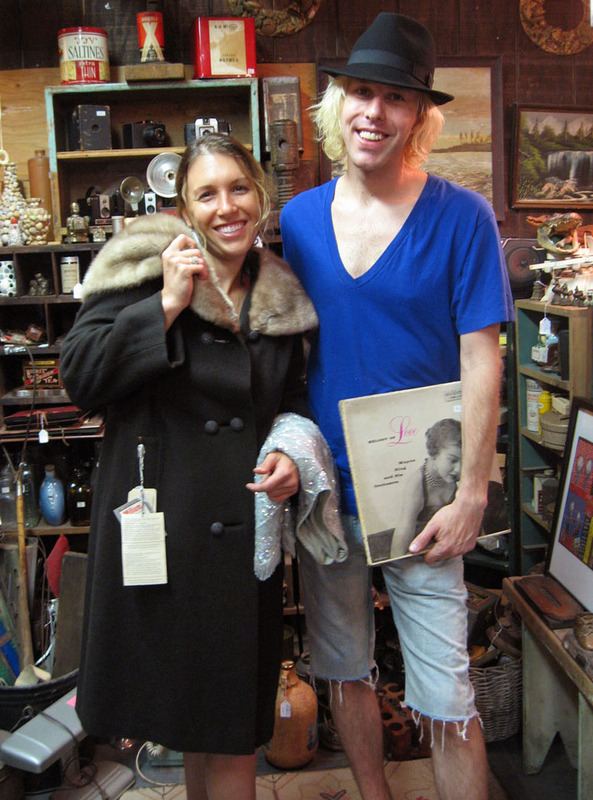 Cassandra – who, as a buyer for Macy’s, knows a thing or two about fashion – scored a vintage 50s NOS (that’s New Old Stock) brown wool coat with mink collar, with original tags ($130.) and a vintage Sixties Hong Kong hand-beaded silver shell top ($95.). Ben, a NY-based painter, whose work is currently being shown at The Gallery Bar on the Lower East Side, worked the vinyl room. Cassandra left us with these words: “This place is fabulous – I’ll be back many times!” Looking forward, Cassandra! 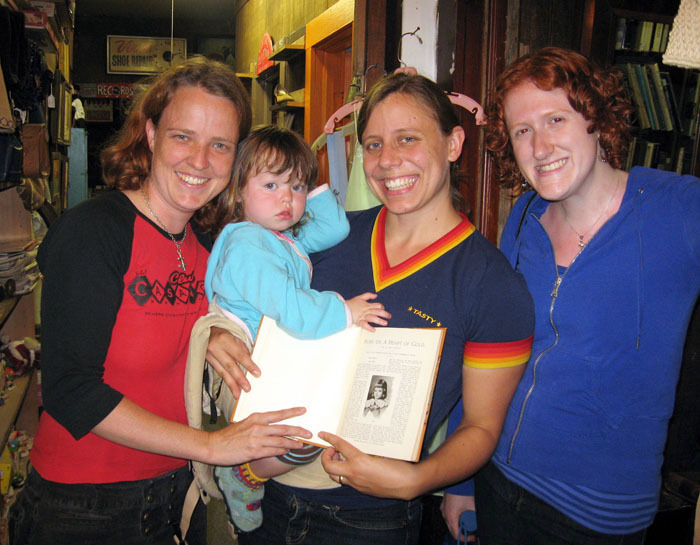 The Watershed Post out of Andes, NY, is our new favorite local news blog here in the Catskills, and the women behind it are Lissa Harris and Julie Resichel, holding daughter Ruby, who, btw, is holding a book called Ruby – Heart of Gold from 1895, which we just happened to have on our shelves. You can’t really tell from this photo, but the 1895 version of Ruby eerily resembles 2010 Ruby. With them is their friend, writer Alison Cherry. OK, now go click on their blog – it’s great reading! Some of the fresh ephemera headed into the Spot. 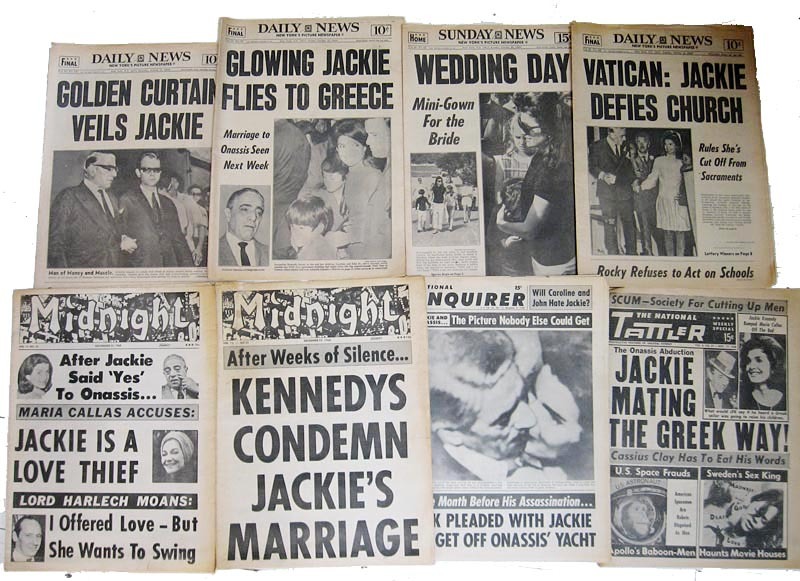 Tabloids from Jackie Kennedy’s marriage to Ari Onassis. (Midnight, The National Tattler, the NY Daily News, and of course the National Enquirer). 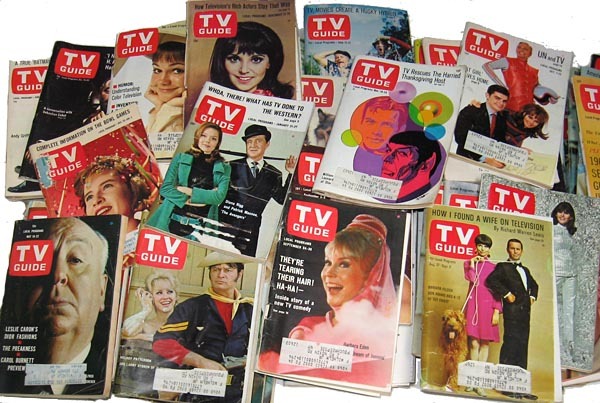 An estate haul of over one hundred 1960s TV Guides. A stack of WWII-era Variety magazines. New Yorker magazines from the 1950s. 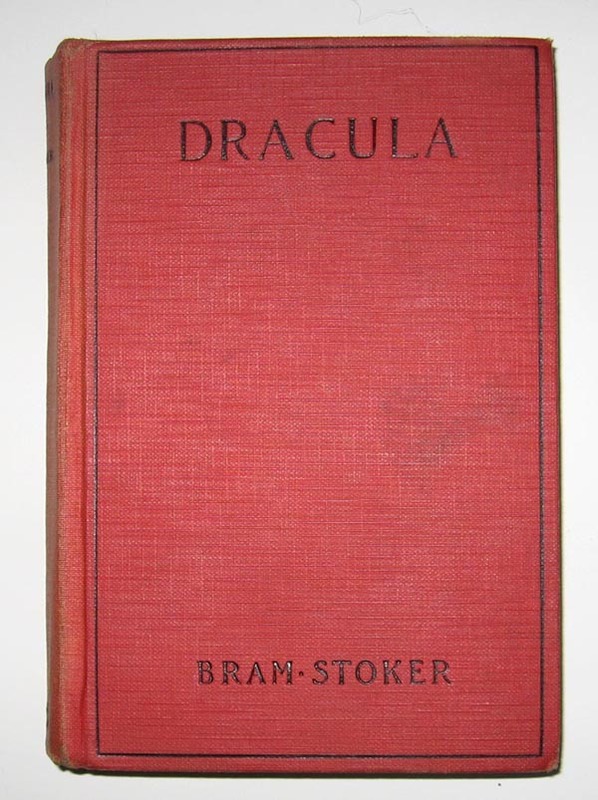 If you have the time, each and every one of these bits of wood pulp is fascinating reading from cover to cover. Trust us, they have not been easy to part with! When Jacqueline Kennedy married Aristole Onassis in 1968 it was big news. These all came from a "Kennedy collection" we picked up at an auction years ago. 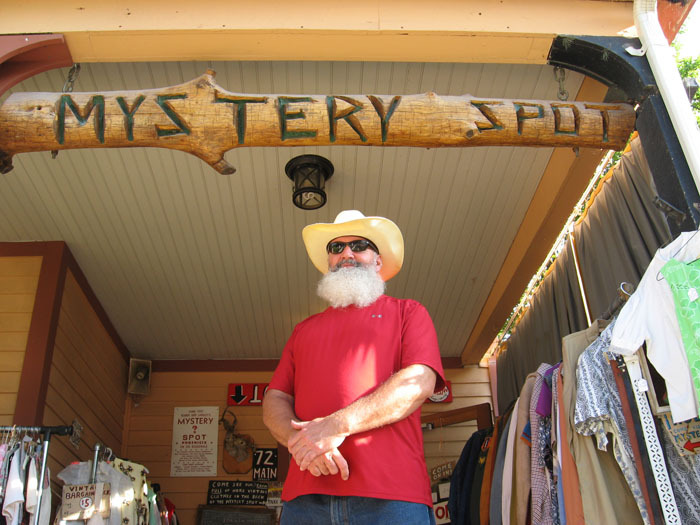 Now at the Mystery Spot, 5 – 10 bucks apiece. 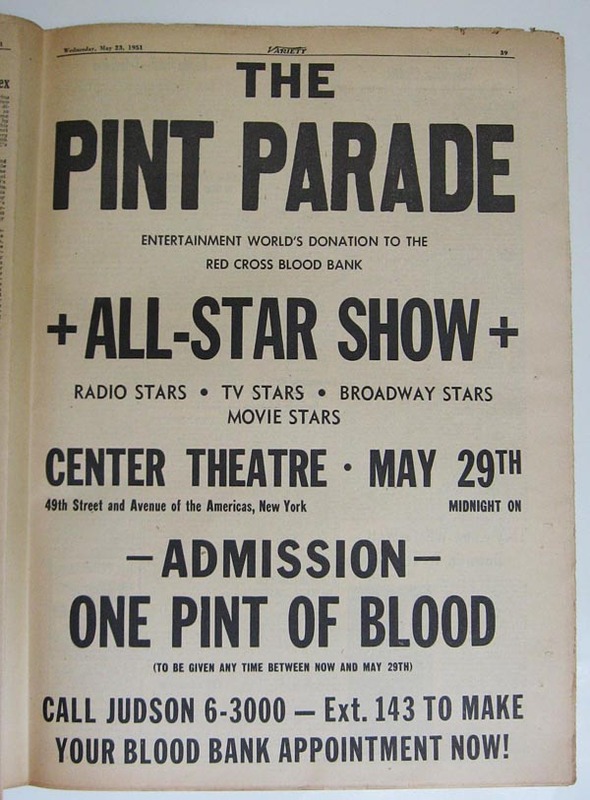 The motherlode of over a hundred Sixties TV Guides from TV's golden years. Get Smart, I Dream of Jeannie, F-Troop, The Avengers, Gilligan's Island, The Flying Nun, The Patty Duke Show, and Star Trek, to name but a few. 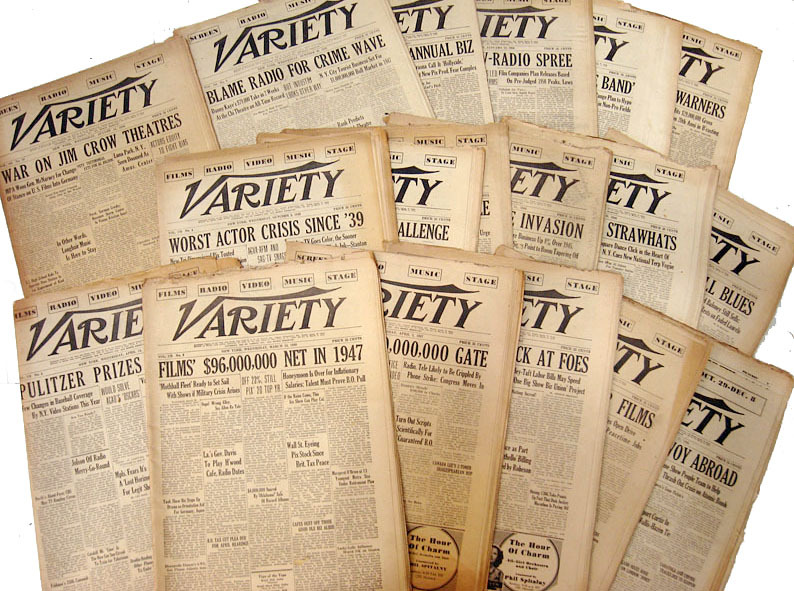 A stack of old Variety magazines from the 1940's. 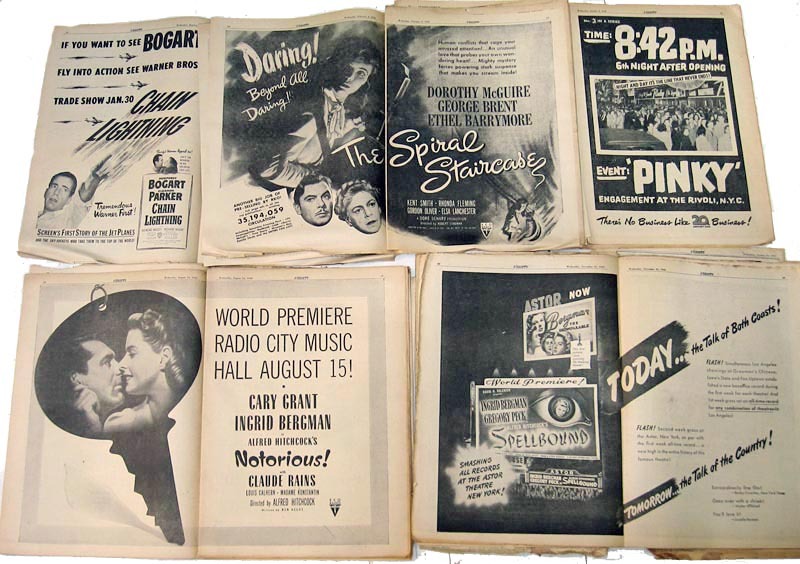 Peek inside a Forties Variety and this is what you'll find: ads for the new releases of the day: Notorious, Spellbound, Chain Lightning. Our favorite pages to peruse are in the back of the magazine, which contain tiny display ads for obscure variety and musical acts on tour. This one caught our attention: Ray Bourbon at the Starlit Room in Hollywood. 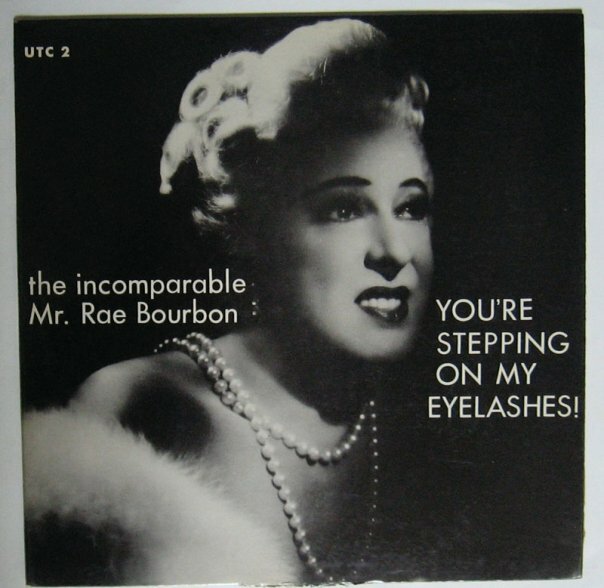 Could this be the one and the same Rae Bourbon, drag performer from the Fifties, whose records we sometimes come across? And what ever happened to Laurette and Clymas? Here's one of Rae Bourbon's albums we've been fortunate to come across. Last summer Shivaree’s Ambrosia Parsley and the Elegant Too’s Chris Maxwell performed a wonderful free show on our porch. Guess what – they’re going to do it again! This time joined by the Elegant Too’s Phil Hernandez. The big show takes place on 10-10-10 at 1 PM. We can’t wait! We’ll post more details soon, but meantime, here’s a very informal rehearsal video we shot last year of Ambrosia and Chris. The song is called All Because You Told Me So. 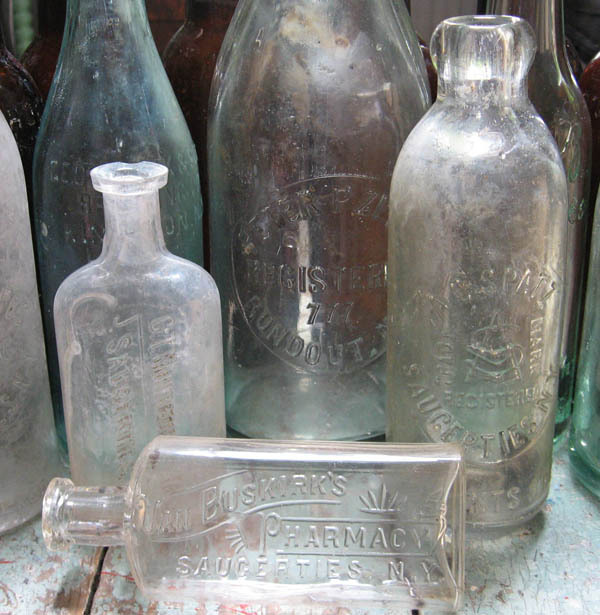 A Barn Filled with Antique Bottles! 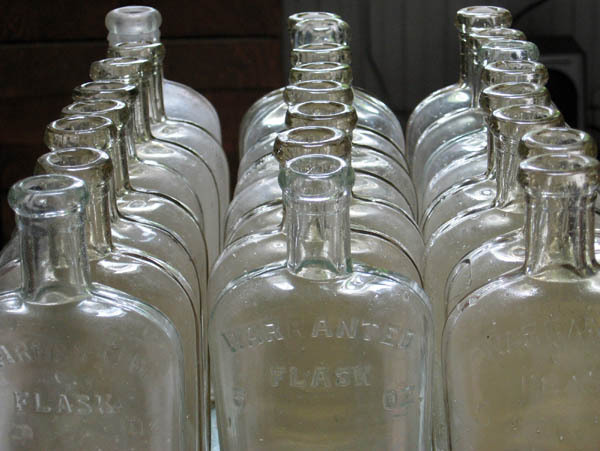 Two dozen Warranted Whiskey Flasks in tight formation. We love it when get house calls like this. Old estate: house, barns and outbuildings, come check it out. Lo and behold, we walked in and discovered boxes and boxes of old bottles. They were all dug up from the Ashokan reservoir back in the day. 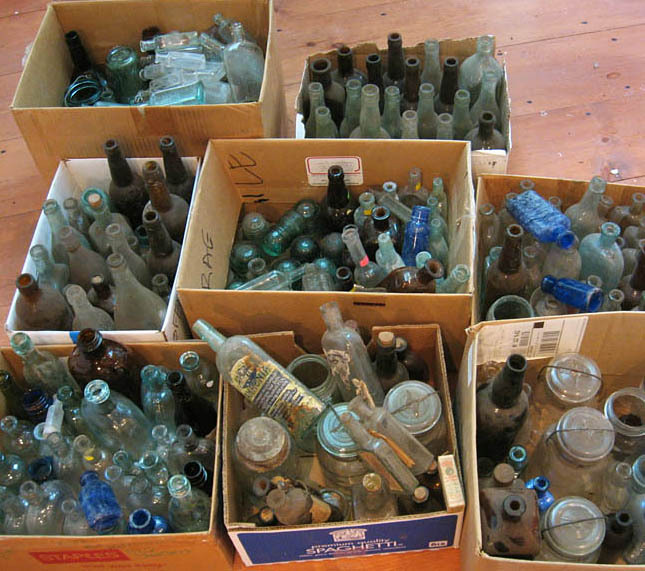 Local Catskills bottles from Kingston, Saugerties, Hudson, New Paltz and Roundout. The Ashokan is located where nine entire villages of almost 2,000 people used to exist, including Shokan, Olivebridge, and Brown’s Station. By 1914 all of the residents had been displaced, and their villages – houses, churches, shops – were flooded. When the tide is low you can still see the old foundations from the ghost towns. 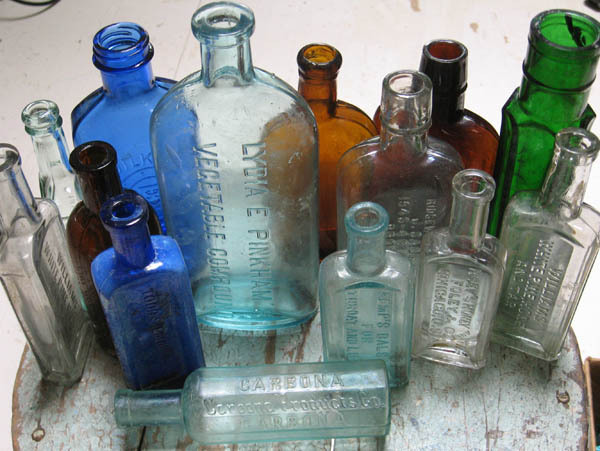 We used to dig bottles in the woods when we came up to the family cabin in the summer as a kid, and that’s a bug you never shake. So we were thrilled to be digging around in this barn, and took several boxes-ful for the Mystery Spot. 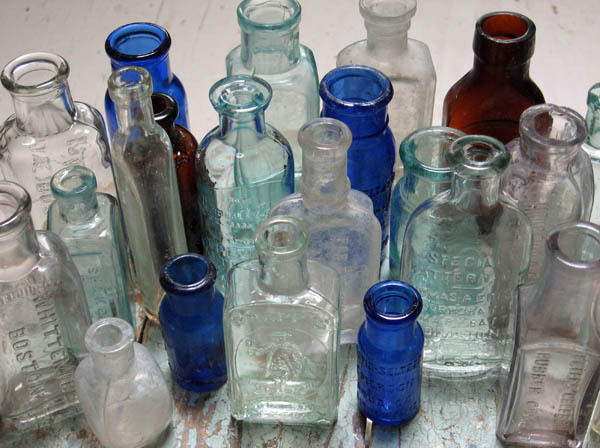 All in all we bought several hundred bottles, including canning jars, old patent medicine bottles, insulators, whiskey bottles, beer bottles and lord knows what else. 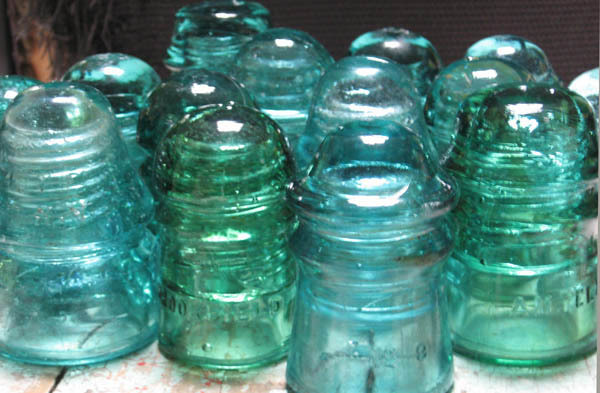 Old glass insulators, full of bubbles. We’re still going through them all. We doubt any of them have any significant value, but we’re just happy to look at them all day. 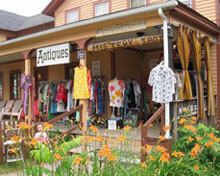 We hope to have some out on the Mystery Spot Antiques shelves by this weekend. Come to Phoenicia and check ‘em out!